How can I make money while on vacation? 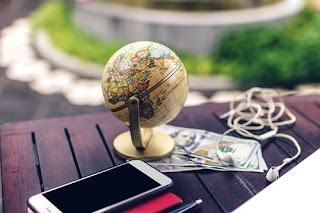 How can I make money while traveling? Can I earn and travel at the same time? We have answers for all these questions you have it in mind. We will provide you with ways in which you can earn money while you travel. but that is not the case after the internet has arrived. work when you on a vacation. You should have some skills, without skills it will be hard to find work and make money while traveling. vacation or you want to spend on your ongoing vacation. your destination and then finding work will be a hectic task. You should always work on vacation if you are on a small budget. It's about being creative and finding good opportunities for work. Before you move ahead, Remember many countries will not pay you by cash. So, create a PayPal account before traveling to your destination. We have provided you with many ways below to make money while traveling so chose whatever is best for you and try it. 1. Teach English and Get Paid. This is a very simple and an easy job you can find while you are traveling. and they prefer people from USA and UK. So if you are one of them you can go for freelance English teaching. Countries who demand English teachers are Japan, United Arab Emirates, Korea, Cambodia etc. You will get paid on an hourly basis in the local currency. You have to decide and bargain with the employer to fix you an hourly rate to teach English. If you don't know English you can also go and teach your native language. Search online for jobs if anyone needs you for teaching. 2. Earn Money by Street Performing. common street performance acts which will help you make money while traveling. You need to find a busy and a famous tourist place at your destination and select your street corner to perform. These kinds of jobs for even on busy hours which means 2 hours a day. Can fetch you good money which can be used for your hostel accommodation and food. Remember not to break any local law when you opt-in for street performance. Read the law before starting to work or work besides a street performer you see around the place. I know you don't want to pay a big fine when you are on a vacation. 3. Sell Your Travel Photographs. There are many sites which will help you to sell your travel photographs. Google it for the best suitable site for you. Here you need to click high-resolution pictures with a good DSLR camera. Adjust the resolution and sizing before you start clicking or selling it online. You can click photo's of people, places, historical items, nature, moments etc. I will suggest you edit the photos and make it more attractive. You can use tools like Photoshop or CorelDraw. Try to capture images which shows a story behind it. money while traveling uploading photos to stock photography sites. When you upload photographs they will ask you to accept their terms and condition. You must read the policy of the site on how they will pay you or what rules you should follow etc. 4. Become a Diving Instructor. can make money while traveling. There are many places in the world for Eg:- Thailand, Australia, Mexico etc. Where you can find a part-time job of becoming a diving instructor. There are companies who offer part-time training jobs. So search for one at your travel destination and contact the staff via email. You can also visit the company and apply on spot. If you do not have the certificate, I will suggest you attend a diving course yourself. And then become a diving instructor in the same company. 5. Work in Hostel to Get Free Accommodation. free accommodation if you work for them part-time. It is known as travel volunteer workers. You can contact the hostel via email and try to find out such places for a free stay. They also sometimes provide meals including the stay. Here you won't make money but you will save money which you would spend in a hotel for your stay. There are hostels and hotels who offer you job and pay you for the same. But I will recommend you to find a hostel who offers free stay. This is more profitable. 6. Make Money While Traveling by Freelancing. If you have some special skills or you have basic knowledge about computer or data entry work. Then you will be able to find a freelance job at your travel destination. You can become a freelancer and apply for freelance jobs in your area. Here you will have to work 2 to 3 hours a day. Use sites like freelancer.com, UpWork.com etc to apply for work. This is the best option as these sites are famous among freelancers. 7. Become a You Tuber. V-logging has great growth and you can earn money being anywhere in the world. You don't have to add ads inside the video, YouTube will help you with this. We will recommend you to make your channel well in advance before going traveling. This is a long-term plan where you can keep posting video and earn while traveling. There are other sites also like Vimeo which will help you earn via ads for your videos uploaded. 8. Become an AU Pair. Very fewer people know and have heard about becoming an AU pair. AU pair means you will have to take care of children's of a particular family. In exchange, they will provide you with food and accommodation. If you want to make money while traveling ask for a stipend if you do not want accommodation and food. There is an age criterion which is 18-26 years of age and also you should have clean criminal records. If you have experience of childcare then your chances of getting this work are brighter. This is the best job if you want to live and explore local living abroad. If you become an AU pair there are chances you will get help in getting the work visa. 9. Be a Tour Guide. In this case, if you yourself are new to the destination. Go and explore first and become an expert in knowing the place well. Once you have learned about the place and you are confident of yourself that you can explain to others. Go and be a tour guide of places you know well. This is a freelance job and you can get paid well for doing it. If you are a good guide you will make your tourist people laugh. Don't make things boring for travelers. 10. Be a Crazy Bartender. Bars and pubs are worldwide. Bars who are in a tourist place. Search for international staff who can handle their customers coming from abroad. If you think you can do the job of bar-tending then it is a great way to make money while traveling. You will also meet new people and communicate with locals having fun and earning money at the same time. Try to get a job in a hotel bar then going for a local nightclub or bars. Because hotel bars pay well in comparison to local bars. If you are good at PR and have great talking skills. Then be a promoter who holds a banner or who attract visitors to your employer's shop by talking skills. talk to strangers and bring in new customers. They generally pay you in cash if the visitor you got brings the restaurant a sale. 12. Work at a Cafe While Traveling. This is a very simple and a common job which every backpacker does. If you want to work in a cafe you can reach out to local people and ask info on famous cafes nearby your location. Reach out to the cafe and meet the boss. Ask if any work is suiting your profile. If the position is empty and suits the boss you are ready to go. This work is somewhat a risky one, but if you are an expert in the field of poker and casinos. Why not give it a shot at the local ones. Sports betting is getting more and more popular nowadays as it has become a work from home job. People who are expert in gambling can make money while traveling. By logging into their online betting account and a TV in front of them. Only do this if you are an expert or else you will end up spoiling your vacation. If you are good at painting then you have a nice change to make money while traveling. Once you reach at your destination go and buy a canvas and start painting what you love. When you are done with your painting, Hit the famous tourist streets and put your painting up for sale on the streets. Do this only on famous tourist spots. As tourist will misunderstanding of you being a local. And will end up buying your painting understanding it as a local piece of art. The best thing for every traveler is getting a working holiday visa. These types of visa are not issued by every country. Only specific countries are offering this visa. This visa lets you stay in the country for 1 year. And also work for any job you think it is of your interest. There is an age constraint in getting working holiday visa which is around 18-30 years of age. Australia, Canada, New Zealand, and Singapore. Are some countries I know who offer working holiday visa. You can make money while traveling on a long-term basis. As you might get a contract at-least for 6 months if you get a working holiday visa. while traveling they often look up for work exchange offers. Here you will work for people to get some small amount of salary or accommodation or food. It depends upon what the employer has to offer you for your work. There are sites like wwoof.net where people post their requirements. This site is for working on farms and getting a free stay. You have to contact people who post if you want to work for them. 17. Sell Digital Products Online. If you want to enjoy your vacations and travel the world without worrying about your work. Then sell digital products online. For examples:- I am a writer and I have published an eBook. For selling eBooks, I don't have to worry to be at my office always. People who will buy online will get their downloads when they go pass the payments. It is an easy way to make money while traveling for people who are good at writing and publishing books.